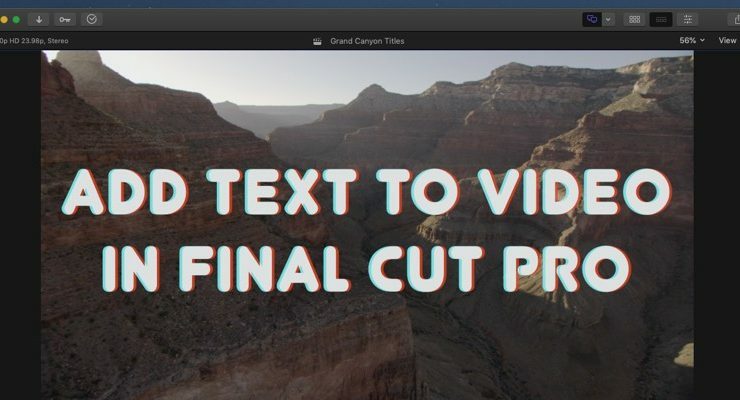 By using titles, you can add text to your Final Cut video projects. This could be something like the title of a video, the location of a scene, the role of an interviewee, or a source for archive footage. While these uses all have different names, they are simply different permutations of the same basis titling systems used in Final Cut Pro X. From intertitles to credits to chyrons, any text (or indeed, any non-video objects) that appear in the project come by way of Final Cut Pro’s generator system. In this case, they’re produced by the title generator. Effects, on the other hand, have their own generators. It’s best to practice before you leap in to a real project, especially because Final Cut Pro X’s user interface isn’t best suited to the fiddly sliders of complicated titles and the inspector window can sometimes fight your intentions. But, overall, the system fits in well with Final Cut Pro X. 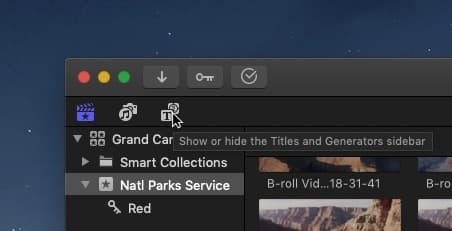 For enthusists and skilled amateurs (and indeed, professionals), Final Cut Pro X’s title tools might seem limited or poorly built. But that’s when you turn to After Effects. 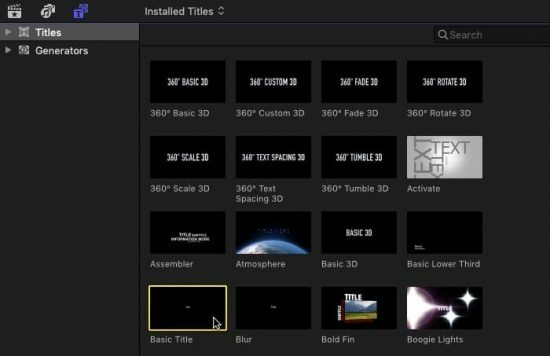 Final Cut Pro X isn’t isn’t trying to include all of After Effects in their video editing platform, and it does allow the user to swiftly create highly functional if samey title cards. Start from an existing Final Cut Pro X project. Titles should be added near the end of the editing process, after the primary picture and sound have been largely locked. In the Library pane in the upper-left, click the “Titles & Generators” sidebar button. This pops open a window with Final Cut Pro X’s preset titles. In generally, we want find the title that is closest to your end goal and select that for this project. We can modify the details of any title, of course, but making a static centered text title from scrolling Star Wars pre-roll text is the slowest way to make progress. For the purpose of education we will start with a rudimentary title and work our way up. Select Basic Title and insert it into your timeline. You can drag the title into the timeline or double-click to insert it at the playhead. Click on the title in the timeline to select it. You will know it’s selected if it’s highlighted in yellow. If the Inspector pane is hidden, reveal it by clicking the Inspector’s slider button. Of the several inspector panes available, you might intuitively select the Title Inspector icon, but this won’t help. This pane is employed by pre-built titles that expose certain settings for quick user configuration. For our titles, click the adjacent Text Inspector icon in the Inspector toolbar. To enter the title’s content, select the content of the Text textbox and replace it with your own content. If your content does not fit on the screen, you may need to manually insert line breaks or use multiple title cards. In the Basic section below select the typeface, text size, and and other text options. If the section is hidden, hover your cursor to the left of the undo arrow and click Show, or double-click on the section’s name to reveal the section. 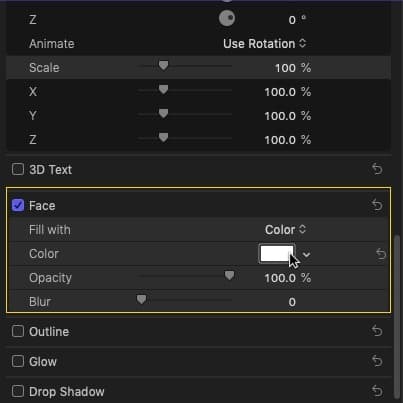 To change the color of the text, use the Face section. This controls the appearance of the front, or face, of the title. We can also add additional visual features is the dropdowns below. Text can be extruded into three-dimensions, given a drop shadow to separate it from the background, and more Photoshop-style layer effects that help the text to better blend with the underlying video footage. If you find that these tools aren’t powerful enough o accomplish what you want, Apple’s Motion allows you to create your own Title presets with a far broader range of tools. These titles can then be exported from Motion and into Final Cut Pro X’s user presets. 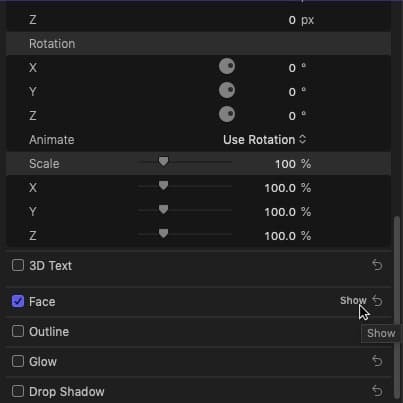 Titles can be moved around the preview window with the positioning sliders in the inspector. If you want to animate these features, you’ll need to use Final Cut Pro X’s keyframe system. In the Text Inspector pane we can modify the content and appearance of our text. Using built-in presets, we can apply styles quickly. To fade a title in and out, use the Transitions Browser like any other clip. 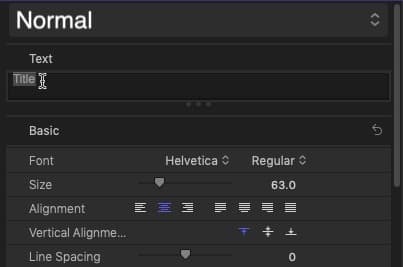 Click the icon to reveal the Transitions Browser, then drag the desired transition onto the purple title clip in the timeline. Three-dimensional options are available in the 3D Text section in the Text Generator Inspector panel. Once you turn on 3D Text, your title’s entire appearance will be controlled from that section. Use the tick boxes to quickly enable and disable settings in the Inspector pane. The undo arrows reset sections to their defaults. Titles should not be pushed all the way to the end of the image. On older screens, titles at the edge of the picture would be cropped by the television. Today we don’t have that problem, but aesthetic convention dictates that major titles appear in the center of the screen. Follow these conventions unless you have a good artistic reason to break them. Video used in this feature comes from the National Parks Service‘s collection of public domain video files.